Where is SAS going and why should people believe in SAS? 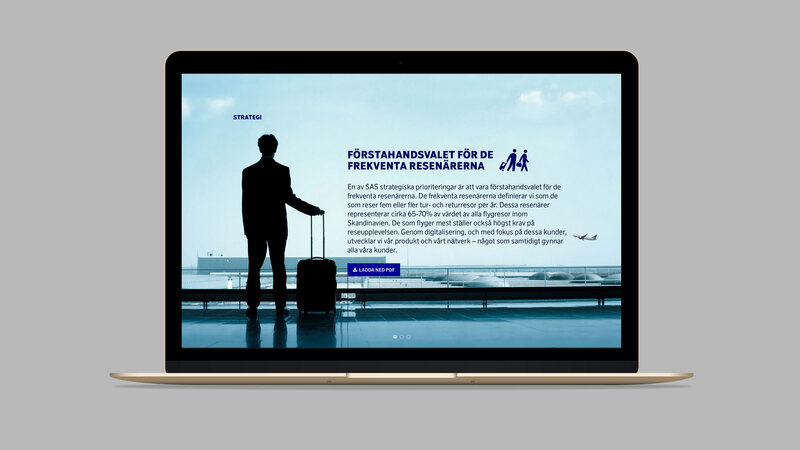 As an airline, SAS operates in one of the world’s most competitive industries, and there is major interest in the company, both in Sweden and abroad. 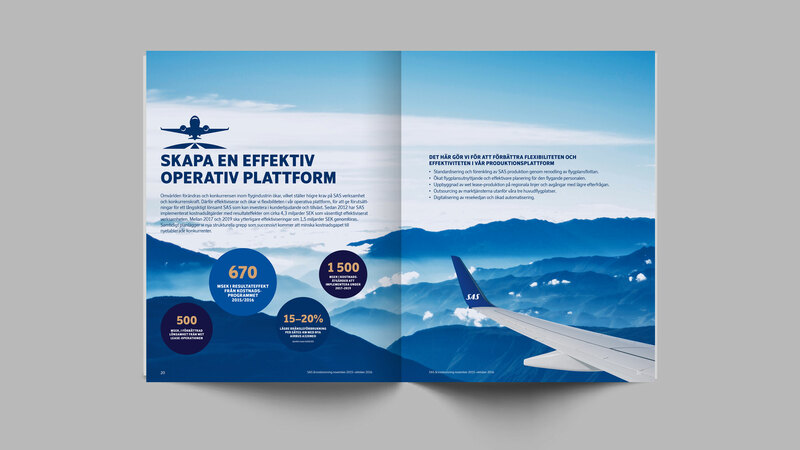 The ambition was an annual report which more clearly conveyed the potential in the company and the established strategy, but which did not duck the challenges that exist, both for the industry and for a niche airline such as SAS. One change compared with previous years is a greater focus on how SAS creates value, both for the company’s stakeholders and owners and for society as a whole. SAS also wanted to clarify the most important reasons to invest in the company for potential investors, and en route create a brand-building product that is even more permeated with SAS than before. 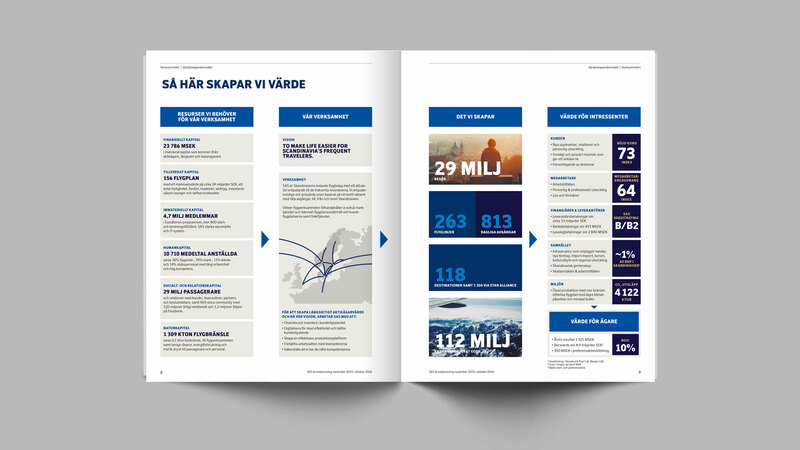 In order to clarify the value which SAS creates, this year’s annual report starts with the company’s value-creation model. Here SAS reports in a transparent way on both the resources that constitute the basis for the operation, what the company gives back to society and what value the business has for different interest groups. 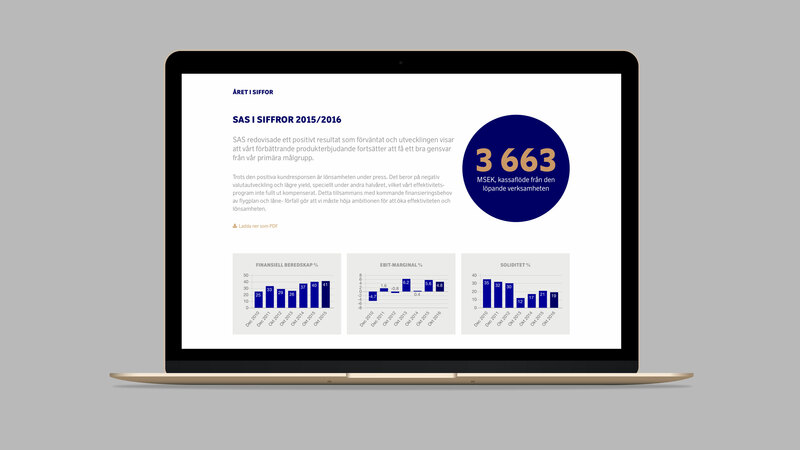 The result is a comprehensive and easy to understand report with a clearer focus on SAS as an investment and on the value that the company creates, for its stakeholders, but also in a broader perspective. For example, non-financial key ratios and areas have been accorded more space than previously and the company’s role in facilitating trade, tourism, cultural exchange and regional development has been described. SAS has – in common with many companies internationally– utilized the potential of more clearly communicating its value-creation for society. The trend has gradually emerged since the framework for integrated reporting was issued in late 2013.